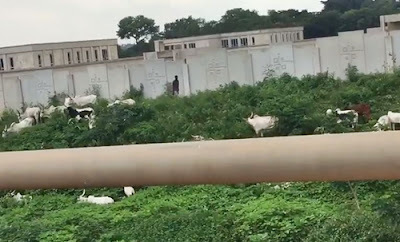 Some cows have been captured in a free grazing chamber after they gained entry into the National Assembly in Abuja on Monday. According to a video clip published by TheCable that has provoked reactions in social networks, the cattle took charge of a part of the legislative chamber eating grass and moving freely. There has been a campaign to ban open grazing in the nation's capital, especially in the center of the city, where cows roam the main streets.